We've been organising walking holidays around the castles of the Cathar Country for over 25 years, so you can be sure of a quality experience: the best castles, villages, hotels and paths in a wonderfully wild landscape, before arriving at the Mediterranean and the fishing/artists village of Collioure. Whether you are a history buff, interested in the Cathars, or just enjoy the wonderful warm Mediterranean climate walking through exceptionally varied landscapes with castles, unspoilt villages, vineyards and intriguing natural phenomena (gorges, waterfalls, sheer rocky pinnacles, sandy coves "to die for"), then this is for you - especially if you enjoy authentic accommodation and exceptional regional cuisine. Private transfers ensure you only enjoy the best "bits". Alternatively, you can drive to Foix where there is plenty of secure parking, and we will take you back there at the end of the holiday. This tour includes daily private transfers (some of them quite long). This adds considerably to the quality, enjoyment and the cost of the holiday, so the prices cannot be compared with other apparently similar holidays. 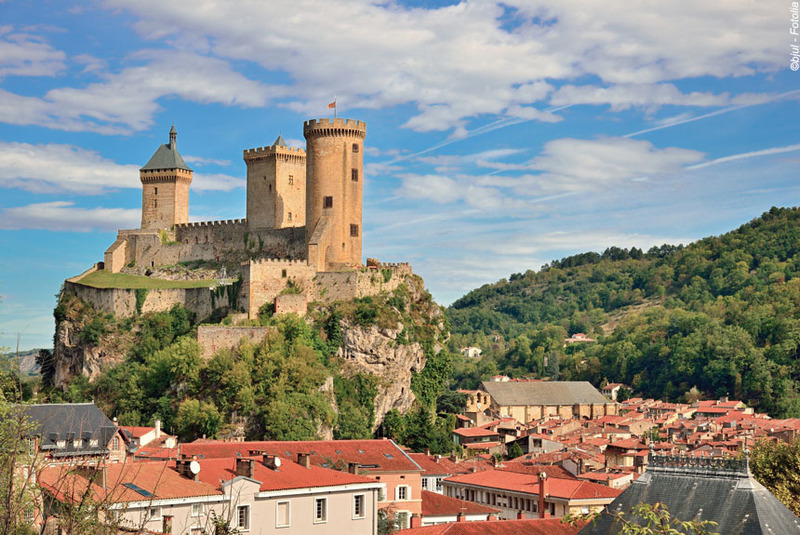 We meet you at Toulouse or Perpignan airport or station (trains from Paris) and, should time allow, we take you to your first Cathar Country stronghold, Roquefixade, where you can enjoy climbing to the top of the castle to get panoramic views of the Ariege peaks before enjoying a warm-up walk nearby. NB: It is also possible for you to drive directly to Foix and leave your car here for the rest of the week. You will then be driven back to collect your car at the end of the holiday for no additional charge. You spend your first night at the three star Hôtel Restaurant Lons right in the historic centre of Foix, close to the castle, and right beside the River Ariege. This is a most welcoming, family run hotel that balances contemporaneity with tradition as is nowhere more evident than in its atmospheric and highly rated restaurant (eat overlooking the river). In the best sense, this is what hotel-restaurants in France used to be like - and too few are these days. Walking time: 2h30. Elevation : +270m / -270m. Transfer time : 1h30. 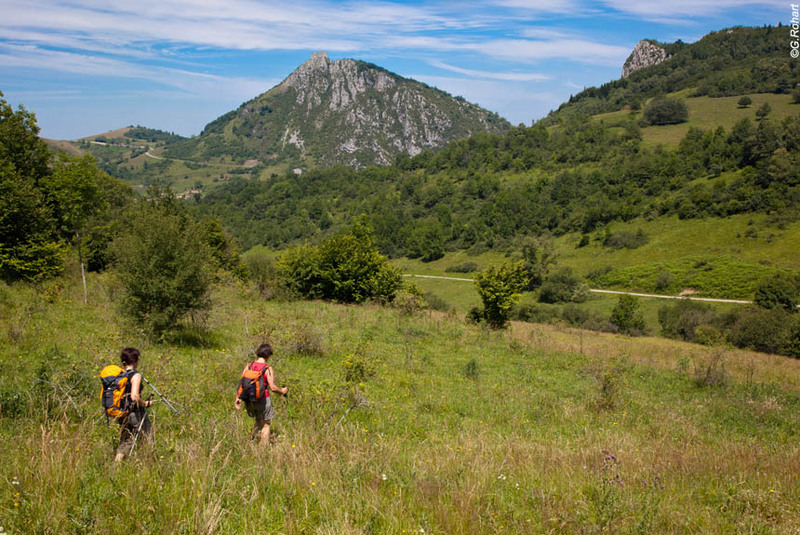 We provide a transfer (to ensure you enjoy only the best "bits") so you have a marvellous walk with fantastic views, historic landscapes, and tranquillity all the way (but no great ascents or descents) to the spectacular site of Montségur. When you see its remarkably secure position, it is easy to understand how this was the last stronghold of the Cathar "rebels" - holding out for 10 months in 1244, then many being burnt alive for refusing to renounce their faith. You descend into the village, and can visit its small, but high quality, museum before we transfer you to Puivert. Puivert is a lovely village with its own lake and sandy beach, deep in the Cathar countryside, and right on the Cathar walking path, the GR7. The Petit Verger (The Little Orchard) is a well run and most welcoming 5 room chambres d'hôtes. The rooms are large, the facilities en suite, the private gardens and woodland delightful, and the food superb in its authentic, rural style. Plus there is a superb local brewery selling authentic real ale just next door. Again, it is the sort of place that is hard to find - and a joy when it is done as well as this. Walking time : 2h30 or 5h30. Distance : 6,5km or 15km. Elevation : + 400m or + 900m / - 400 or - 500m. Transfer time : 1h30. Today starts with a visit to Puivert's chateau, one of the best preserved, and, consequently, most interesting in the region. From there paths take you around wooded hilltops before walking through a most strange (but entirely natural) "green labyrinth" of rocks and trees. 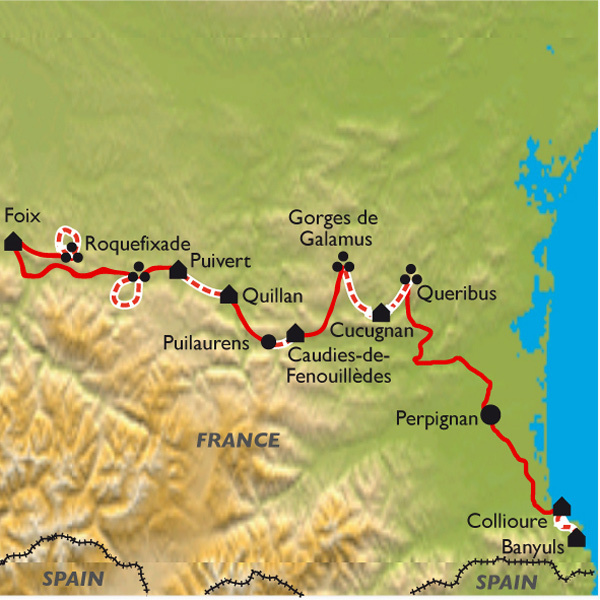 You then continue on the GR7 all the way to the ancient and attractive riverside town of Quillan, or you can choose a transfer to save the last few miles. You stay at the impressive three star Hôtel La Chaumière right in the centre of Quillan, so perfect for a stroll and aperitif before dinner, which offers modern versions of traditional regional specialities. Not just interesting, but good too. Walking time : 4h or 6h30. Distance : 10km or 17km. Elevation : + 250m or + 450m / - 150m or - 650m. Transfer time : 15 minutes. 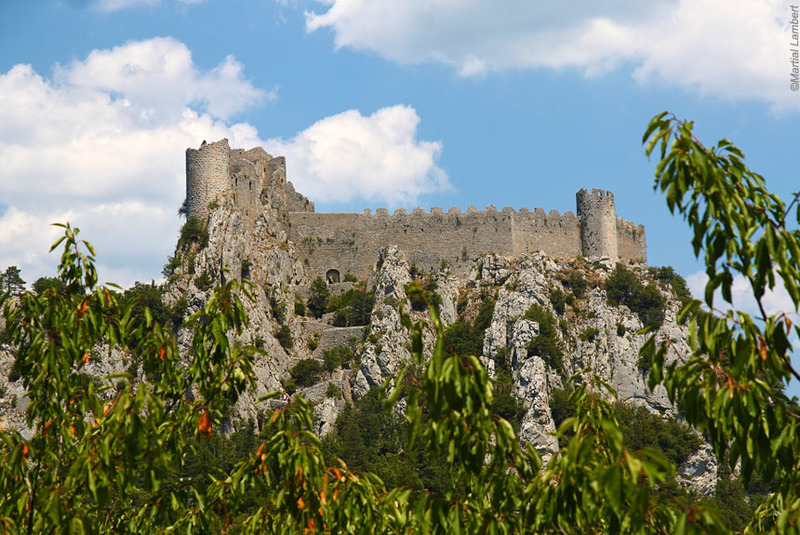 We transfer you this morning to the remarkably well preserved castle of Puilaurens, which certainly saved the lives of many fleeing Cathars as it was protected from Crusader attack by being Aragonese property. 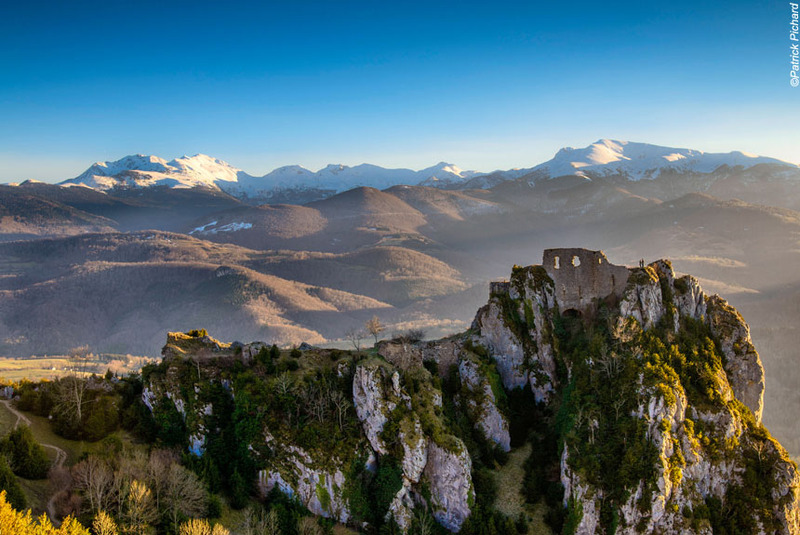 From there you walk through interesting countryside to contrasting Fenouillet: its Cathar castle impressive but now in ruins, its tiny village completely restored, and much praised. You now walk through the "secret", and surprisingly narrow, Gorges de Saint Jaume with its overhanging rocks, wooden bridges, waterfalls, and sense of history almost hanging in the air. Soon after you pass through woods and vineyards to arrive at the charming 15th century pilgrimage chapel of Notre Dame de Laval, and then your destination for today, the pleasant and characteristically rural village of Caudies de Fenouilledes. You stay in the charmingly simple converted winery that is the Relais de Laval. It offers a welcoming ambience, and a gastronomic tour of Roussillon cuisine, which includes elements from the north (foie gras), the west (cassoulet), the east (shellfish), and the south (Catalan stews etc) - not forgetting the local wines, and particularly the aromatic aperitif Muscat. Walking time : 4h30. Distance : 11,5km. Elevation : + 550m / - 800m. Transfer time : 30 minutes. You start today with a transfer to the spectacular Gorges de Galamus - huge cliffs almost touching in parts, houses built into and under rock faces, a beautiful, fast flowing river (a favourite with canyoneers), and the wonderfully located, carved out hermitage of Saint-Antoine. In complete contrast, you then walk through the high altitude "garrigue" (typical Mediterranean low level, soft leaved shrubs and small trees) under vast blue skies (usually!) to arrive at the magnificent eleventh century castle (two castles actually) of Peyrepertuse, called a "ship in the sky" because it seems to sail across the plateau surrounding it. You can now choose a transfer, or walk down to Cucugnan. You stay at the charming, four bedroom, two star Auberge du Vigneron (winemaker), which is an excellent example of an authentic restaurant with rooms as the food and wines are undoubtedly the stars of the show here. Expect to be surprised by the quality, innovation, style and taste of the dishes you will enjoy here. It's the perfect antidote to flashy, expensive city restaurants! Walking time : 5h or 6h30. Distance : 15km or 19km. Elevation : + 650m or + 750m / - 750m or - 850m. Transfer time : 30 minutes. 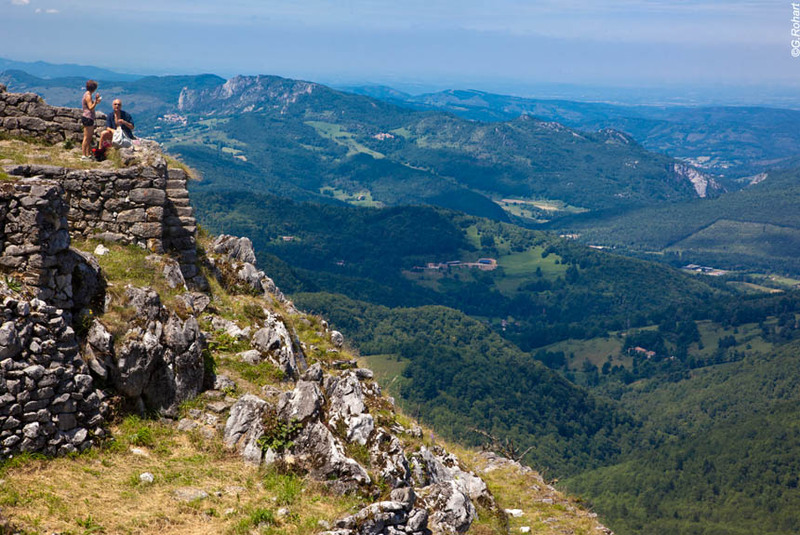 You begin the day with a very pleasant 2 hour stroll along the GR7, Cathar Country footpath, to "inaccessible" Queribus, one of the last refuges of the Bons Hommes, which provides an inspiring view of the blue, blue Mediterranean from its imperious, lone peak situation. This is appropriate as we then transfer you to that Mediterranean at the unforgettable fishing and artists' village of Collioure. You can simply stroll around the colourful village, explore its castle (one last castle, this one where the sea laps its foundations) and museum discovering more about Braque, Matisse and Picasso (among others) who all painted here, or you can take one of several walks that follow paths up through vineyards then back along the cove packed coastline with sandy beaches for a welcoming swim. You stay at the three star boutique Hôtel Mas des Citronniers in the centre of the village, a short stroll from the water's edge and set in its own extensive gardens. You dine in one of our favourite restaurants in the village. Walking time : 2h30. Distance : 4km. Elevation : + 450m / - 150m. Transfer time : 1h30. This is certainly a memorable last day walking along this most attractive - and surprisingly unspoilt - section of the coast where the Pyrenees descends to meet the Mediterranean resulting in vine-covered hillsides, views up to the Pyrenees, dominated by the 8,500 feet Mount Canigou, and a "scrunched up" coastline filled with small, and some tiny, coves and creeks, many with overhanging trees and flowering bushes, sandy beaches, and beckoning turquoise waters, not least the rather larger Paulilles beach. You pass by an old windmill, the fort at St Elme, and walk out onto Cape Béar and Cape Ullastret before arriving, reluctantly perhaps, at Banyuls sur Mer, the traditional Mediterranean destination for an Atlantic-Mediterranean walk. Your last night is spent at the beachside three star Hôtel Les Elmes with its stylish rooms, most with sea views, and gourmet restaurant on a terrace overlooking the Mediterranean. It's a wonderful place to end your journey, and the food is good too. Walking time : 4h30. Distance : 13km. Elevation : + 500m / - 500m. After a relaxing (and perhaps somewhat melancholy) breakfast on the terrace, we transfer you back to Toulouse airport or station. Transfer time : 1h or upto 2h30m. We will pick you up at Toulouse airport or railway station and take you to Foix. You are also welcome to drive to Foix directly - you will then be driven back to Foix to pick up your car at the end of the holiday for no additional charge. At the end of the holiday we take you back to Toulouse airport or railway station. We will also take you back to Foix to collect your car if you wish (no additional charge). This holiday features comfortable rather than challenging walking, and is suitable for anybody who enjoys "a good walk". On most days there are choices of itineraries, which you can decide for yourselves each day. It can get hot in July and August, as well as much more crowded, but the temperatures are moderated by the mountains and sea breezes. We would recommend May, June and September as the best months. You stay in double or twin rooms for 4 nights in three star hotels, and one night in a particularly good two star hotel, and 2 nights ion high quality chambres d'hôtes. You will eat well. Dinners are based on set menus featuring regional specialities usually with 3 or 4 choices for each of three courses, but you can pay locally for upgraded choices. Breakfast is included every morning, but picnics are not as there are no shops or cafes/restaurants en route - and you can always ask the hotel the night before to make a picnic, which you can pay for locally. 7 nights dinner, bed and breakfast ; people transfers; luggage transfers; detailed walking instructions; 1:25,000 IGN map; 24/7 customer phone service.